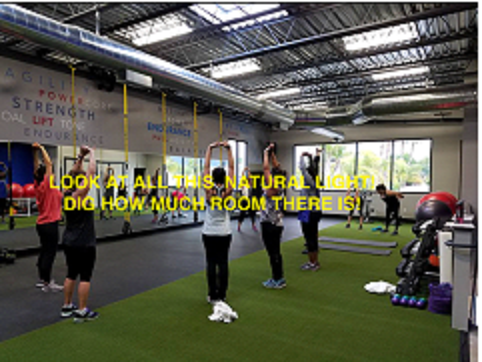 AbsoluteFIT with Lydia: Room to Move! My four-year-old staged a mutiny and would not participate in Playology. Even though it looked like lots of fun, and there were kids he knew in the class, and I made some dire threats (e.g. making him eat something other than a peanut butter sandwich for lunch if he didn’t join the class — OH I AM SO MEAN). So anyway — I really like the new workout space! It’s huge, the non-slippery floor felt good underfoot (and under-face, when I had to lie there for a second after the third minute of plank hip-touches, ay yi yi), and the skylights were a very pleasant surprise when we got down to stretch at the end of the session. It’s a tad echoey, but the natural light and roominess more than made up for that — I can’t wait till we move in for good! I saw a lot of new AbsoluteFIT participants there, so I’m hoping they keep coming to more sessions. Did you guys go to any of the weekend’s events? How did your kids like Playology or Jr. FIT? Share your thoughts in the comments! View the AbsoluteFIT schedule here.